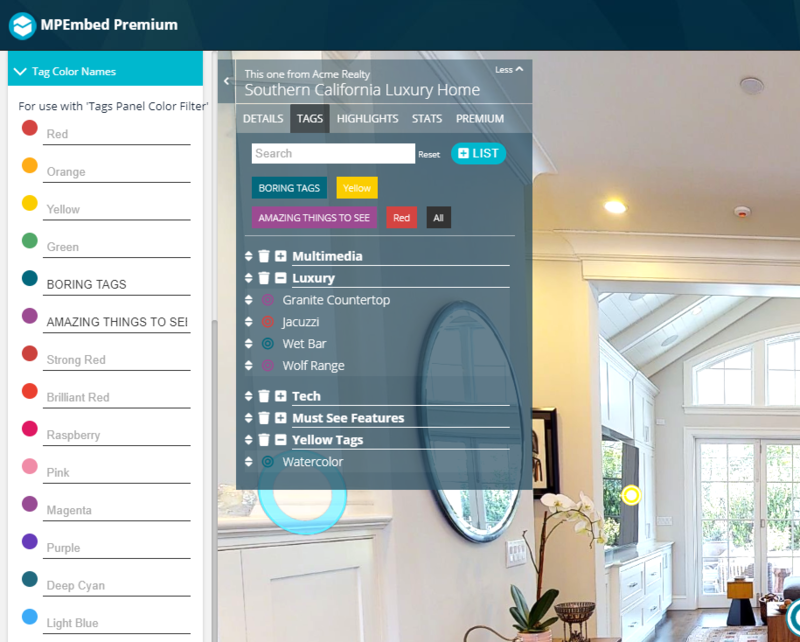 You can now add Matterport Spaces (or MPEmbed URLs) to the highlight reel! MPEmbed automatically pulls the thumbnail from the space and adds it to your highlight reel. 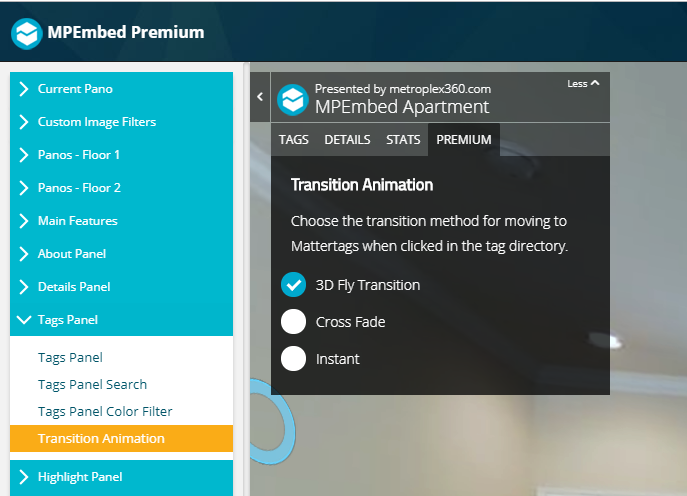 MPEmbed Premium’s highlight reel adds support for adding both YouTube Videos and Matterport Spaces. These are game changing features that many clients have requested that you can now offer them! 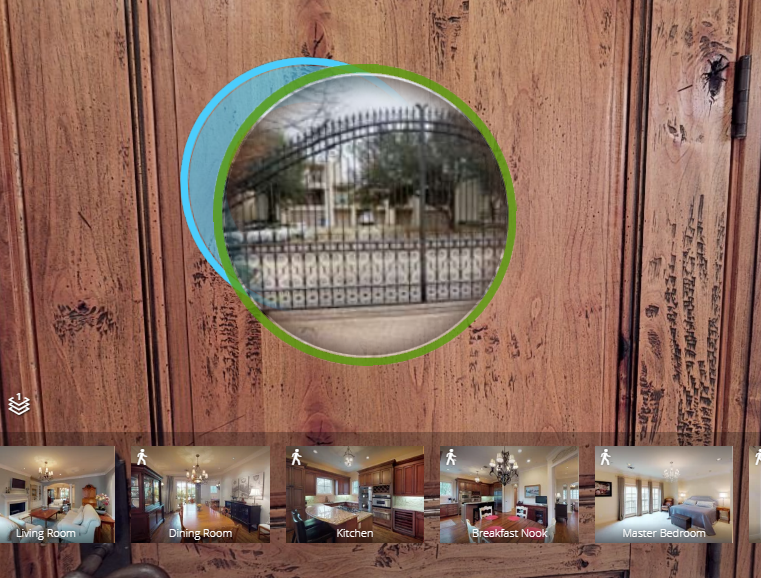 Now you can add Matterport (or MPEmbed) spaces to the highlight reel! This latest addition adds even more possibilities that you can only do with MPEmbed. Are Mattertags making your guided tours look kind of silly? With MPEmbed, you can now turn off Mattertags from displaying during guided tours! A major bug was discovered and fixed that prevented MPEmbed from loading on spaces that were not visible when starting. This bug was worst if a user applied &play=1 to a space. Mattertag Colors are now visible in password protected mode if you have changed the sort order of your tags and saved. I’m still working on bringing the minimap to password protected mode. Announcements open up many new opportunities for storytelling and documentation with Matterport Spaces. There are some occasions where storytelling and mobile might clash – or where your viewer simply wants to view the space distraction free. By popular request, announcements have now inherited the ‘visibility toggle’ – just like the about panel. Announcements open up many new opportunities for storytelling and documentation with Matterport Spaces. There are some occasions where storytelling and mobile might clash – or where your viewer simply wants to view the space distraction free. By popular request, announcements have now inherited the 'visibility toggle' – just like the about panel. Oh, and now the minimap slides when toggling it 🙂 Gotta be consistent, right? Oh, and now the minimap slides when toggling it 🙂 Gotta be consistent, right? 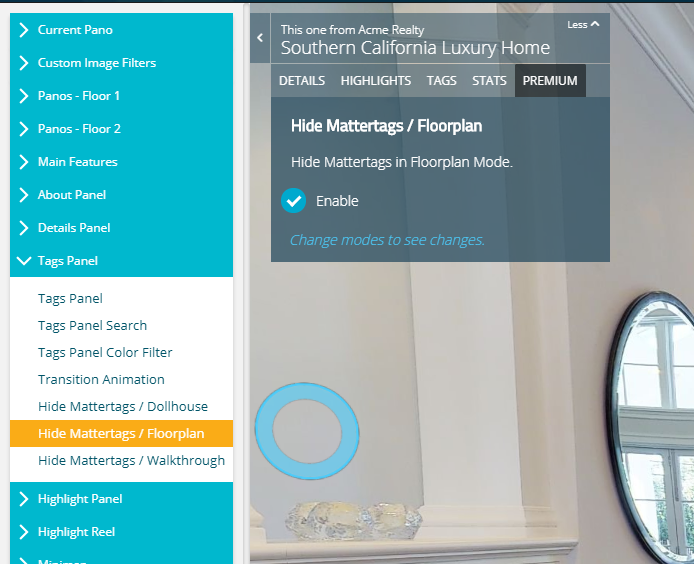 You now have the ability to set background music to your Matterport Space. Users will be able to turn on / off the music from a native UI icon right next to the tour controls. You may also set the volume and whether or you you would like the audio to repeat. A non-repeating background track is a great way to provide an audio intro! It's here – another top request is the ability to set a background music track to your Matterport Space!You can set the default volume (25%, 50%, 75%, 100%) as well as whether or not you would like to loop the audio. This is a killer-feature if you'd like to simply have an audio welcome! Removed rounded borders on color filters. Color filters now turn to default UI color when hovered. Removed extra space at bottom of highlights panel. Changed hover color on highlights reel (was black, now is staying white). Confetti disabled on mobile as it does not perform well. Fixed button that minimizes the about panel — wasn’t allowing people to click it. Fixing &reels caused normal highlights to disappear, which is fixed. Left side of screen was unclickable, which was fixed too. Floor Menu was either invisible or visible — as opposed to open / closed. For desktop users, one would rarely click on the invisible menu. For mobile users, the menu fell in a logical place to click to move. Got an amazing aerial video that you’d like to bundle with your Matterport Space? How about an awesome cat video that you’d love to share. Using 3D Tours for training? Add a training video. The YouTube integration uses the YouTube API and adds a custom start/stop/play mechanism so that related videos are not shown within your space. Videos are also whitelabelled — neat, right? Got an amazing aerial video that you'd like to bundle with your Matterport Space? How about an awesome cat video that you'd love to share. Using 3D Tours for training? Add a training video.The YouTube integration uses the YouTube API and adds a custom start/stop/play mechanism so that related videos are not shown within your space. Videos are also whitelabelled — neat, right?Over the next few days, I'll be adding the ability to sort (you'll have to delete/readd for now). Next provider will be Vimeo, and then probably Embed.ly for embedding other URLs as a catch-all. 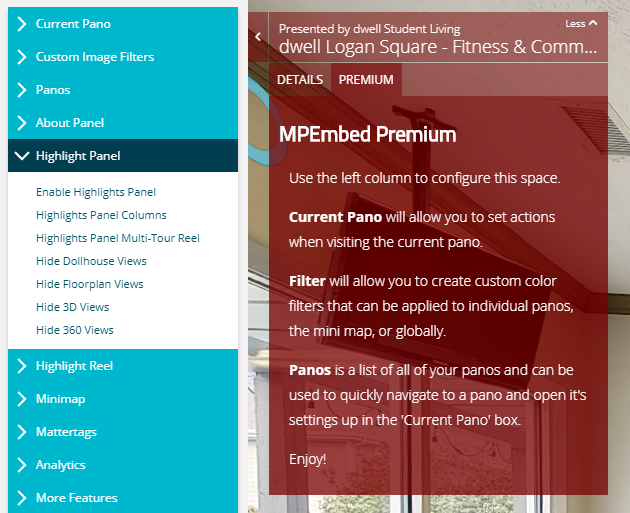 Your MPEmbed Space can have a global color filter as well as individual per-pano filters. If you would like to see which filter is being applied – you can roll your mouse over the recently added filter toggle. If the toggle is on, the name of the filter will be crossed out too! The result? Overlapping issues should now be resolved with announcements that are multiple lines long. Got rid of the 20px black area at the bottom of the Premium UI. This arrived when I shortened the header by 20px last week. More room to work! 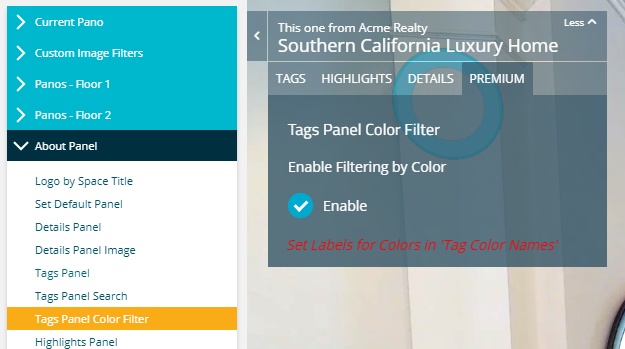 Mattertags Directory can now be scrolled with the mousewheel in Premium. Reduced spacing a bit in the footer area / highlight reel. MPEmbed focuses on maintaining the same look and feel as Showcase. This is a core design philosophy that extends to the Premium UI Configurator where configuration of options happens within the ‘About Panel’. One challenge during configuration is that the about panel disappears whenever the user moves. One solution would be to enable the ‘No Fade’ option (&nofade=1). As this is an option for the presentation of your space, it really shouldn’t be part of the Premium Workflow. As a solution, a new ‘Lock About Panel Fading’ icon has been added. It’s in a really easy to find location, right beside the standard Matterport UI icons. If you are using global or per-pano color filters, it is nice to be able to quickly A/B test your settings. A ‘Toggle Filters’ button has been added. This allows you to quickly turn filters on and off while editing! As a sidenote, the ‘filtersoff’ configuration option has now been removed as it is unnecessary. When adding tons of panorama settings, it can be difficult to remember where you have applied all settings. 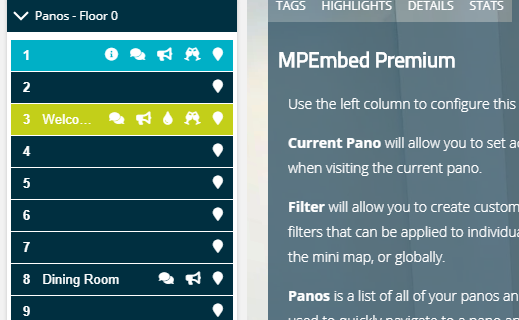 Now you can see status icons for all pano features that are turned on in the panos panel! Some panorama setting checkboxes were not clearing when moving between panoramas. Some multi-select checkbox panels required clicking twice to uncheck the previous option and check the new one. The Mattertag Panel would stop working if Mattertags that were nested in category folders were removed in workshop. &title and &brand were not working as expected. Behavior is now the same as Showcase. You may now choose to filter out the types of views that display in the Highlight Reel or Highlight Panel. This is useful if you have created a guided tour with multiple dollhouse / floorplan views as transitions, but would not like to show them as thumbnails. In addition, it can allow one highlight reel to be used for snapshots only in the ‘reel’, but perhaps showing the dollhouse and floorplan views in the panel. It’s up to you! MPEmbed’s users are amazing and I LOVE how fast bugs are found and resolved thanks to their feedback. I was unaware that the Mattertag Content Panel — which appears when you click on a Mattertag in the Mattertag Directory while Mattertags are turned off for the sapce — (&mdir=1&mt=0 / Disable Mattertags + Enable Panel) — was causing the entire about panel to disappear while closing. Fixed! I also discovered a bug of my own today and resolved it quite quickly. Custom filters and events on the ENTRY panorama were not being applied when a tour began. This was a quick fix. If you discover something that is not working as you expect, please drop a line! Fixes are fast and I could not possibly find them all without your help! You’re all my quality assurance team — and you guys do not miss a beat! Here’s to a new year with so much more to do, create and enhance!!!! Do you need a fancy invoice to help you with writing off MPEmbed this tax season? We’ve got you covered. 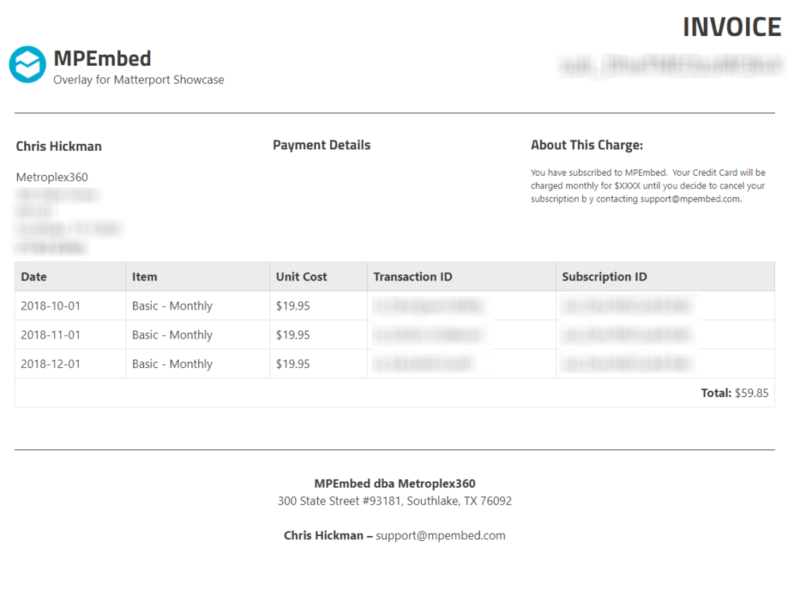 You can now access a printable invoice for each month — or a single invoice for the entire year — within the ‘Billing’ tab. Be sure to complete the ‘profile’ tab to provide the information that you would like to see on your invoice. 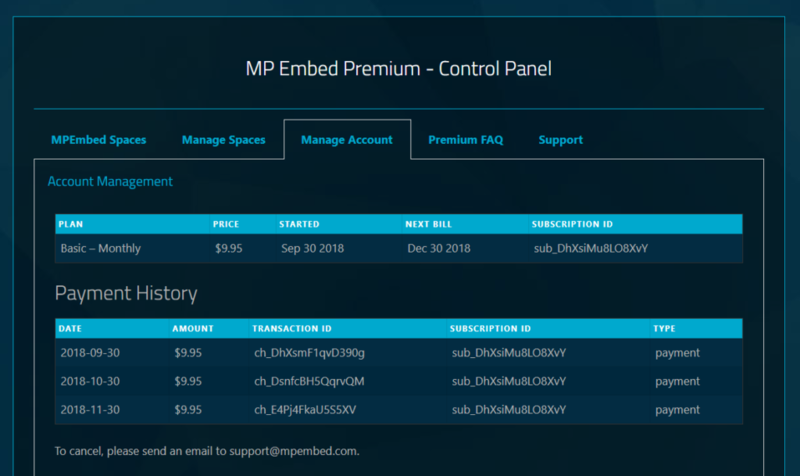 MPEmbed Premium – Account History now available. This is also great if you change subscriptions or have issues with payment as the actual transaction dates will display. 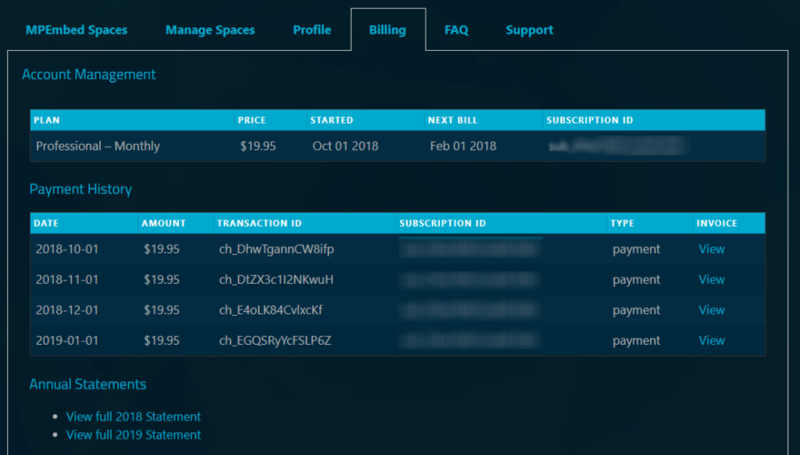 I’m hoping to add the ability to upgrade your subscription from your control panel as well as cancel your subscription. I’m not too much of a fan of cancellations, but even less of a fan of not providing the option. Now MPEmbed features text-to-speech for announcements! The voice that reads your text will change based on the language that you are using! Of course, this means that if you are writing in all caps, the language that you choose might opt to spell out the letters. This feature is Best Experienced in Chrome! Another great reason why MPEmbed rocks! Panorama Actions: Announcement + Hotspot Colors! You can now set text to appear as users navigate your space. ‘Announcements’ are attached to individual panoramas. You can add the same announcements to multiple panoramas in order to constantly show the name of the room that you’re in — or you can hide them like easter eggs. Additionally, you can now also set the colors of hotspots on the minimap individually. It’s pretty exciting what you can do with MPEmbed! Pano Actions: Announcement Text + Hotspot Colors! You can now set text to appear as users navigate your space. 'Announcements' are attached to individual panoramas. You can add the same announcements to multiple panoramas in order to constantly show the name of the room that you're in — or you can hide them like easter eggs.Additionally, you can now also set the colors of hotspots on the minimap individually. It's pretty exciting what you can do with MPEmbed! I also fixed a nasty bug that was happening that may have impacted settings saved for panoramas (hotspot visibility, hotspot labels, etc.) that impacted spaces edited in the past two weeks. I reviewed everyone’s saved data and no more than 20 spaces were ‘possibly’ affected. Glad to get past that! I should mention that ‘Announcements’ is one of many features made possible by the completion of ‘UI v2.0’. By being able to fully control the user interface, the highlight reel can be opened and the ‘Announcements’ will move up along with it. Previously, the user interface was preventing quite a bit of progress. So … next up … adding videos into the highlight reel? A user let me know that embedding on social media would show ‘Explore [name] in 3D’ – regardless of the language used. I’ve fixed that! (Great Feedback). This prompted me to do a bit of an audit on the code for MPEmbed … spacing / indenting / and validating. Spacing and indenting one’s code is merely cosmetic (many people crunch their production code to keep people from stealing it and to marginally speed up loadtime). I like good looking code! On the other hand, having 100% standards compliant code helps resolve browser issues and speeds up render time. I’ve audited MPEmbed’s code and streamlined where needed and fixed a few little things. 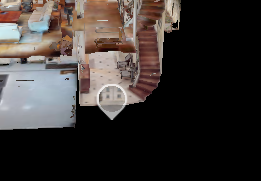 For what it is worth, Matterport Showcase 3’s page has 4 errors and 3 warnings. The code that is dynamically created contains many more error messages – a total of 84 errors/warnings combined. 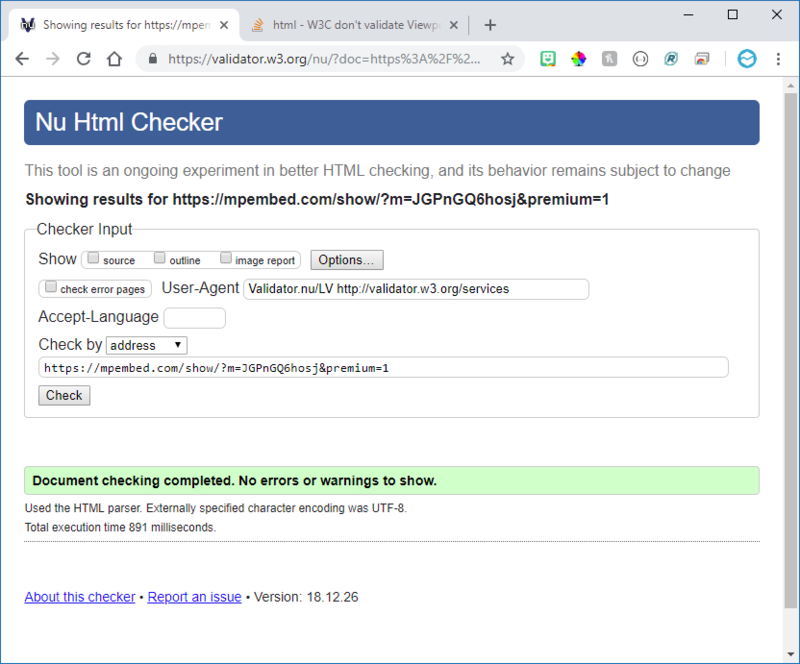 Now of course, while MPEmbed has (currently) error/warning free — we’re still embedding Showcase, so this does not fix that. The Mattertag Directory gets even more customizable now with color filters — only in MPEmbed Premium. 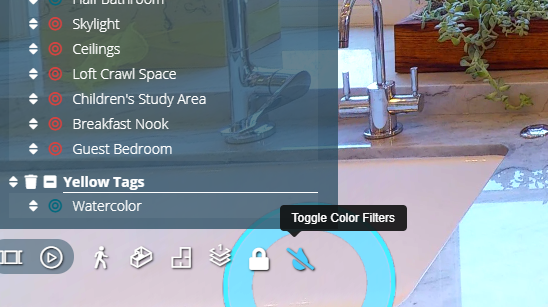 Colors can be relabelled and combined with lists to provide many amazing ways to use Matterport Spaces to document and annotate with Mattertags. The Mattertag Directory gets even more customizable now with color filters — only in MPEmbed Premium. 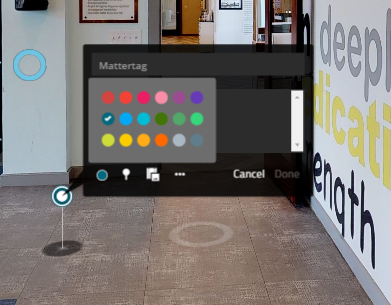 Colors can be relabelled and combined with lists to provide many amazing ways to use Matterport Spaces to document and annotate with Mattertags. There have also been a pile of little tweaks and bug fixes to both MPEmbed and the Premium Configurator. White Balance and Tint controls now show results immediately. Hide Panel During Tour option works again! Play Tour button now swaps to ‘Pause’ Tour button while playing. Highlight Reel auto-Centers when clicking on a frame. Deleting custom UI Text will restore text to the default text. Fixed some cosmetic issues in Premium including mouse-over effects on the configurator menu, reducing the header by 20px and making the buttons a bit smaller.